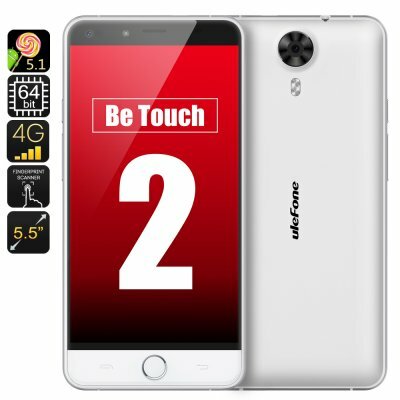 Successfully Added Ulefone Be Touch 2 4G Smartphone - Free Tempered Glass, Android 5.1, Octa Core 64Bit 1.7GHz CPU, 3GB RAM (White) to your Shopping Cart. The Ulefone Be Touch 2 takes a step beyond its predecessor all encased in an alluring metal frame case. Sporting an upgraded 5.5 inch 1920x1080 IPS OGS display with Gorilla Glass 3. It has 4G connectivity and the powerful 64 Bit 1.7GHz MTK6752 Octa Core CPU, 3GB of RAM and runs the new Android 5.1. Exclusively at Chinavasion, now with a free tempered glass screen protector! One of the most noticeable upgrades on this flagship phone from Ulefone is the screen. It has gone from a 720p to a full HD 1080p. Still the same 5.5 inch dimensions but now everything will be displayed a little better on the Be Touch 2, if that's possible. Making use of IPS and OGS technology means that you get great color depth with a lush look that's sharp and easy to see even in bright sunlight and from wide angles. This screen has an impressive 401 pixel per inch (PPI), that's the same as the iPhone 6 plus. The Ulefone Be Touch 2 uses the powerful Octa Core MTK6752 CPU which clocks 1.7GHz and this runs alongside 3GB of RAM. Ulefone state that this can reach 45000 on the benchmark tests, which put it right up there with the fastest phones on around. Enjoying the latest gaming experiences and multitasking is easily handled by the 8 core CUP and Mali T760 MP2 GPU. With 4G support this SoC lets you enjoy the fastest mobile internet speeds around there are two SIM card Slots that both support quad band 2G, 3G and 4G connectivity for flawless network coverage wherever your adventures take you. Running on an Android 5.1 OS you can enjoy the one of the best user interfaces available for smart phones with smooth transitions between tasks and a multitude of customization options allowing easy organization of contacts and services. The rear of this camera features a photographers dream in the shape of a Sony IMX 214 13MP camera that produces impressive pictures that capture the world in all its beauty. To bring your more enjoyment for longer the Be Touch 2 has a 3000mAh battery that keeps this phone going for longer reducing the how often you need to charge it. This product is available to order now, we offer a 12 months warranty on all our products. Brought to you by the leader in electronic devices as well as wholesale Android Phones, Chinavasion. Excelent product for price! Clear original android 5.1 - perfect! Thanks , Chinavasion !